These two Hawaiian beauties are on their original card with original overwrap. Both are untouched by human hands, thereby, retaining its original mint luster. Please refer to page 126 of the book Hawaiian Money Standard Catalog, Second Edition, by Medcalf & Russell. The significance of these medals to Hawaiiana numismatics is that the destination of the inaugural flight was Honolulu, Hawaii. On this flight passengers were gifted with the proof-like medal without card. 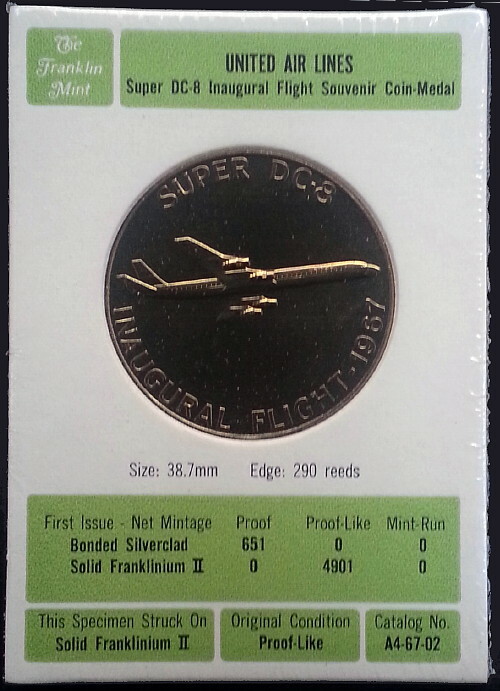 Official mintage figure is stated as 4,901 on the card; however, two other sources indicated a total mintage of 6,724. 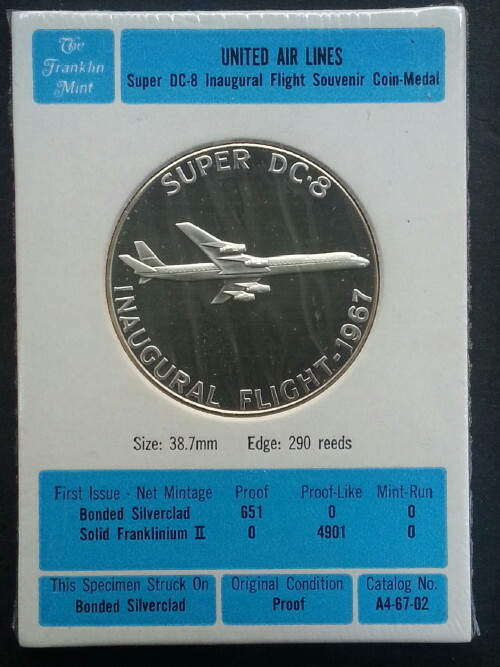 It can be assumed that the difference of 1,823 medals was provided by United to passengers, flight crew, ground crew, other employees and vendors working on the Super DC-8. As for the mintage of 4,901 on the card, it can be the census for the medals only issued on card. The 651 and 4,901 on card census has also decreased as collectors discarded the card for direct access to the medal. ← Duke Kahanamoku Statue Dedication Medal?